The impact of stormwater runoff on nearby waterways is a significant concern in any developed area. Runoff from roadways and parking lots is frequently channeled into drains and pipes, many of which outlet into a stream, river, or lake. Impervious surfaces such as roads, rooftops and asphalt parking lots do not allow water to infiltrate into the ground. As a result the sediment, phosphorus, de-icing materials (salt and sand) and other pollutants collected as stormwater flows across impervious surfaces often ends up in nearby waterbodies. Stormwater runoff directly impacts a waterway�s long term-stability. As more development occurs, generally more water runs off the land into nearby waterbodies, typically following a precipitation event. A large volume of water entering a stream in a short period of time can cause a widening of the stream channel in order to accommodate the increased volume of water. These channel widening processes result in accelerated stream bank erosion, and may lead to increased downstream deposition (deltas). Best Management Practices (BMPs) include stormwater standards for erosion and sediment controls. BMP maintenance is as important as the installation. Maintenance allows the BMP to function properly and to its specified design standard. Maintenance on BMPs is necessary due to the pollutants collected in the various practices. The sediment, floatables and debris must be removed prior to the BMP reaching 50% of its capacity. Once the BMP reaches or exceeds 50% of it capacity, certain systems may start have reduced functionality and treatment ability. 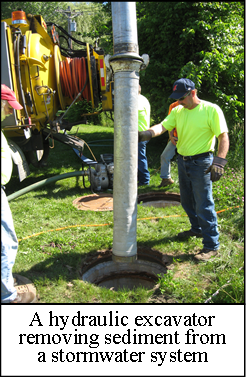 As part of the maintenance process, routine inspections of BMPs need to be done to know how the practice is functioning and how often maintenance is needed as it may vary in different locations due to de-icing practices and volume of stormwater runoff. 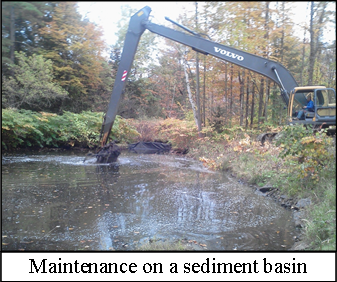 Common maintenance practices required with BMPs are, removal of sediment from inside drywells, along silt fence, in roadside ditches and within sediment basins. Many subsurface stormwater infiltration devices have drop inlets with grates that need to be cleared of debris especially during fall. The growing number of rain gardens in our communities require removal of sediment and debris as well as plant maintenance. Included in the maintenance is checking that the BMP is properly installed. The two lower photos on the right show silt fence improperly installed. The first photo demonstrates how the silt fence was not trenched in the ground and the second photo shows the improper placement of silt fence in a ditch. Silt fence should be installed along contours and trenched in the ground to slow stormwater velocity, collect debris, prevent headcuts and allow for infiltration. Each BMP has specifications written for maintenance based upon design standards. More information about Best Management Practices can be found in the NYS Standards and Specification for Erosion and Sediment Control document on the NYS Department of Environmental Conservation website.